The Buche Blanc is the non-ashed version of our fresh pressed goat cheese. It is a quality fresh pressed goat cheese that everyone loves. 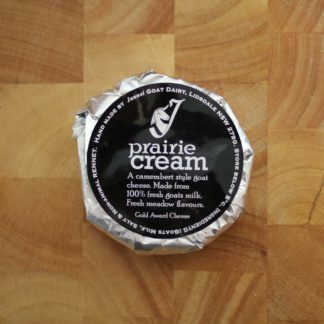 Unlike traditional pressed goat cheese from France this cheese is mild and creamy with a lovely delicate flavour. Not usually entered in awards because the Buche Noir wins. But when on its own it has had great success! It is a champion by default. Soft, creamy and delicately flavoured cheese it can’t help but please. On a cheese platter with various processed cheeses it always has standout flavour! Firm enough to slice. It can be used in cooking, salads or a cheese platter. You can use this versatile cheese as a savoury or sweet. Grill in a sandwich or place it in a pasta. Try your hand at maturing cheese by rolling into balls and wrapping in grease proof paper, place in a container and store in the refrigerator for a few days. Toss the balls in fresh salad with light dressings. Buche Blanc is packed in 150gm rounds, a 250gm log, and bulk in a 1 kg log. It keeps well and has a 2 month best before date.